"Roasting these without oil or salts first lets them crisp up perfectly. Letting them cool in the oven is crucial to the crunch factor. Season with a teaspoon of your favourite flavours: combine sea salt with pepper, garlic powder, chili powder, chipotle, cayenne pepper, curry powder, lemon pepper, or anything you like." Spread chickpeas on paper towels; allow to air dry completely, about 45 minutes. Spread chickpeas on prepared baking sheet. Bake in the preheated oven until golden, about 40 minutes, shaking pan every 10 minutes. Remove chickpeas from oven; toss with mixed spice and salt. 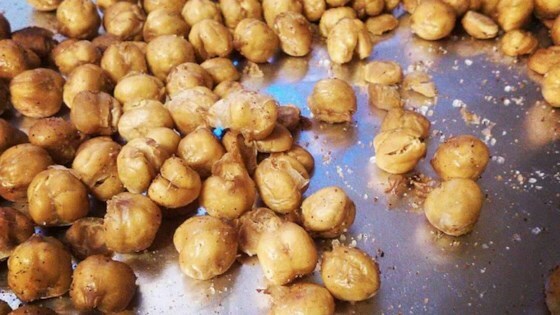 Place chickpeas back into the oven; turn oven off until completely cold, about 2 hours or up to overnight. I baked them too long I think and they were too hard. I might try again, but the flavor wasn’t there. I've made these twice now and they're great for snacking and so much healthier than potato chips.